We have been working hard at Feel Good Community to turn community ideas into reality. At the last Ideas Factory Cov we heard how people find the colder months hard as the nights are drawing in and people don’t get out as much. The lack of sunshine can affect people’s wellbeing. We wanted to do something about this and help people change their mindset about winter so we spent time researching and have found a simple way the Danes use to create a sense of wellbeing during their darker months. So with that in mind, we planned a special evening to help people think creatively about how they can winterproof themselves and their homes for a more Feel Good season. 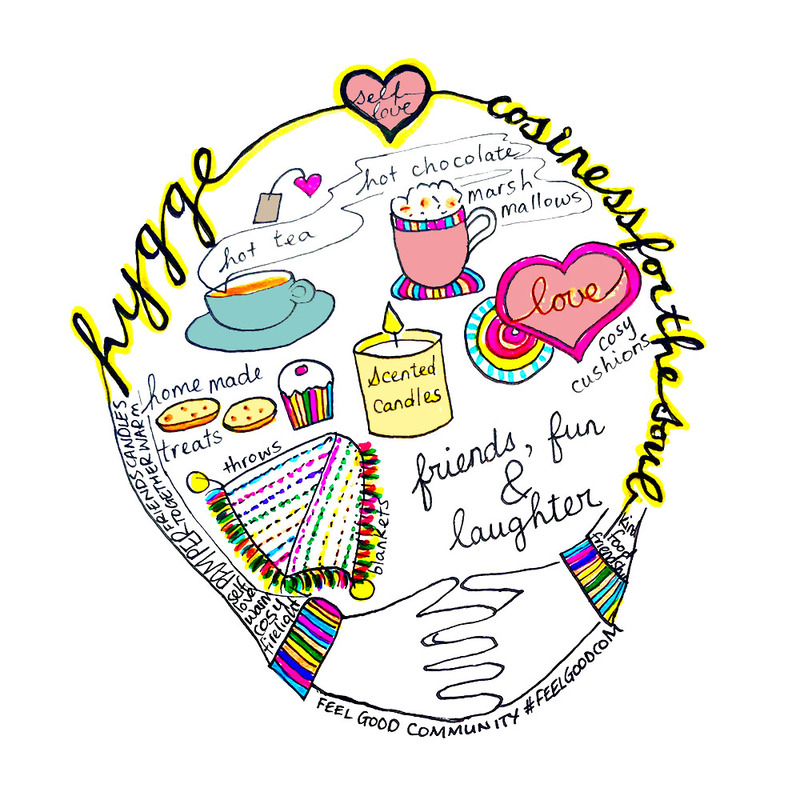 We took inspiration from the Danes and their amazing tradition of Hygge, pronounced Hoogah. We also added some simple science of happiness activities that could be easily recreated. We turned Theatre Absolute into a cosy front room, by adding cushions, blankets and lots of candles, due to health and safety we had to be creative on this one! We played games, doodled, some of us even took part in knitting lessons on the sofas! Whilst the food was being prepared we wrapped up and went on a group walk around the City Centre giving out our handmade random acts of kindness along the way. It was lovely to see people’s reactions as they were handed flowers or reindeer noses. When we returned to Theatre Absolute our senses were indulged in some ‘cosiness for the soul’ Think comfort, warmth, friendship and food! Whilst we warmed up we heard about other community activities that were taking place in Coventry and the USA! As the Danes love their two wheels and our friend Gemma from Time Union, Coventry will be partaking in a bicycle challenge that will take her across the states we thought this is a perfect opportunity to ‘get on your bike’ and help her to raise some funds for her trip. There was no need to go outside as we had managed to get a stationary bike with the help of the slow rollers from Slow Roll Coventry for people to clock up their miles. This was all made possible by our growing community. People donated items we needed, made scrumptious vegetarian hot pots and baked delicious cakes. We even had a vegan banana bread hand delivered by a chap on his bike! A HUGE thank you to everyone who was involved.